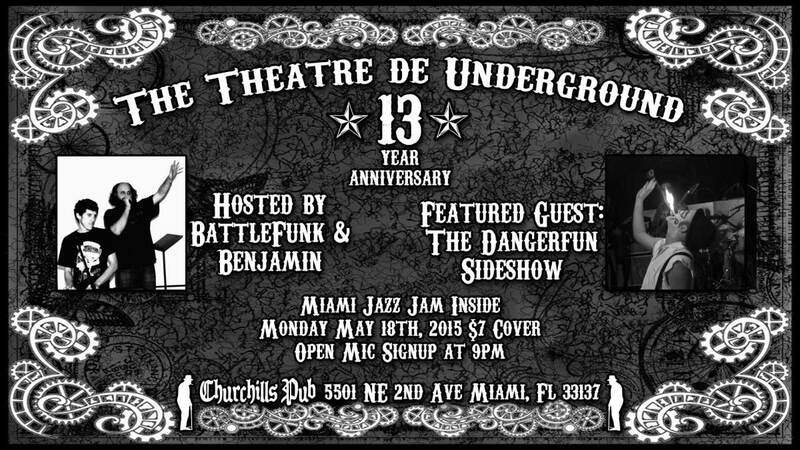 Join us as we celebrate 13 years of Miami's most open minded (and longest running) open mic night- The Theatre De Underground! Since it's inception in the early 2000's the Theatre de Undergound has featured poets, story tellers, musicians, bands, comedians, magicians, jugglers, and a few things that can not be categorized. Join us on May 18th as we celebrate 13 years of making Mondays magical. Featured guests are the Dangerfun Sideshow. Open mic sign-up at 9pm with our hosts Sean Davila (aka Battle funk) and Benjamin Shahoulian. Inside the pub, celebrating 15 years and counting, is the Miami Jazz Jam hosted by Fernando Ulibarri & Mike Wood. That's two shows for the price of one!